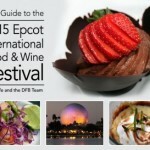 “DFB Guide to Walt Disney World Dining 2012” Contest! Great news! We’re finalizing the 2012 edition of The DFB Guide to Walt Disney World Dining e-Book right now, and we want to share the excitement with you! So we thought this would be the perfect time for a Disney Food Blog contest — you could be the first to get your hands on a copy of the 2012 Edition of our acclaimed e-Book! Deadline is short, so send in your entry today! Erin Foster, our illustrious Disney Food for Families columnist, came up with a really fun idea for the contest — Six Word Restaurant Reviews! To enter the contest, simply write up your own Six Word Restaurant Review about any Disney restaurant (it’s OK if you’ve never been there! ), and send it to us — with SIX WORD CONTEST in the subject line. Contest entry deadline is 11:59PM on Tuesday, April 10th! Coral Reef: See food. Seafood! Watch while eating. Garden Grill: To every restaurant, turn, turn, turn. 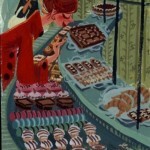 50s Prime Time Cafe: I ate my veggies. OK, Mom? Sci-Fi Dine-In: Burgers taste better eaten in cars. Sunshine Seasons: Eating Sushi while waiting for Soarin’. Send your Six Word Restaurant Reviews to be entered to win a copy of the 2012 edition of The DFB Guide to Walt Disney World Dining e-Book. It’s that easy! We’re hard at work updating our DFB Guide to Walt Disney World Dining e-Book with new chapters, updated information, new photos, games, and even more additions! 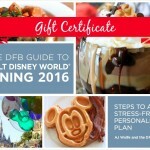 The 2012 DFB Guide to Walt Disney World Dining e-Book will be an instantly downloadable PDF guide, featuring over 300 full-color pages of photographs, information, and advice about our favorite things — food and dining in Walt Disney World. 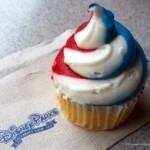 It’s guaranteed to help you make the most of your Walt Disney World dining! 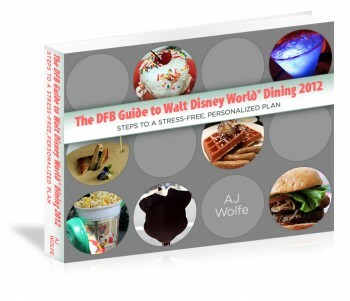 Winners will be chosen via a random drawing on the day the 2012 DFB Guide to Walt Disney World Dining launches! We’ll announce the winner in our celebration post that day, and contact the winner via email to let them know they’ve won! Contest entry deadline is 11:59 on Tuesday, April 10th! Thanks in advance for participating, and good luck!